Sweeney Todd sits awkwardly between genres: it is certainly not a populist jukebox easy-watching affair but is generally seen as a musical, nonetheless. Logically, however, it really should be an opera. Its plot is so melodramatic that it makes Tosca seem positively gritty and realistic and is musically highly complex and symphonic. Very few, if any, shows could be as comfortable straddling both genres as Sweeney, and the success of the Michael Ball/Imelda Staunton production at Chichester & the Adelphi (West End) as well as a production at the Met Opera in New York underline this. Fans of Stephen Sondheim, and of Sweeney in particular, were wetting themselves with delight when this gem was announced.Singing the title role: Bryn Terfel, reportedly the highest-paid opera singer in the world, and the definitive Don Giovanni, Wotan and Flying Dutchman. Playing Mrs Lovett: Emma Thompson, five-time Academy Award-nominee and two-time winner – the only person ever to win Oscars for acting and screenwriting. With a a 48-piece orchestra and playing in the largest theatre in London with the widest Proscenium, this was like a fantasy in the minds of Sondheim-lovers. But following a successful Lincoln-Centre version in 2014, the production is now at Oswald Stoll’s magnificent Coliseum for 12 performances. This is billed as a semi-staged, concert version, without a full set. The cast walk on to the stage in evening dress and stand behind music stands, but during the magnificent Ballad Of Sweeney Todd, proceed to break expectations and rip their outfits and deface the setting to signal that this will not be a staid concert rendition. The conceit is novel and, having committed to it, the company has been clever in finding amusing little coups-de-theatres, such as having the body of Pirelli stuffed into an ENO transport box. I personally would have preferred a lavish million-pound Victorian set – if we are still in fantasy production mode – but the audience seemed to love the mash-up style and it will only have detracted at the end if people do not know the plot, where it will have been difficult to work out who has had their throat slit and been pushed down the chute to the basement and who has merely been kicked into the oven. I suspect most of the audience knew Sweeney intimately already, so this may not matter. 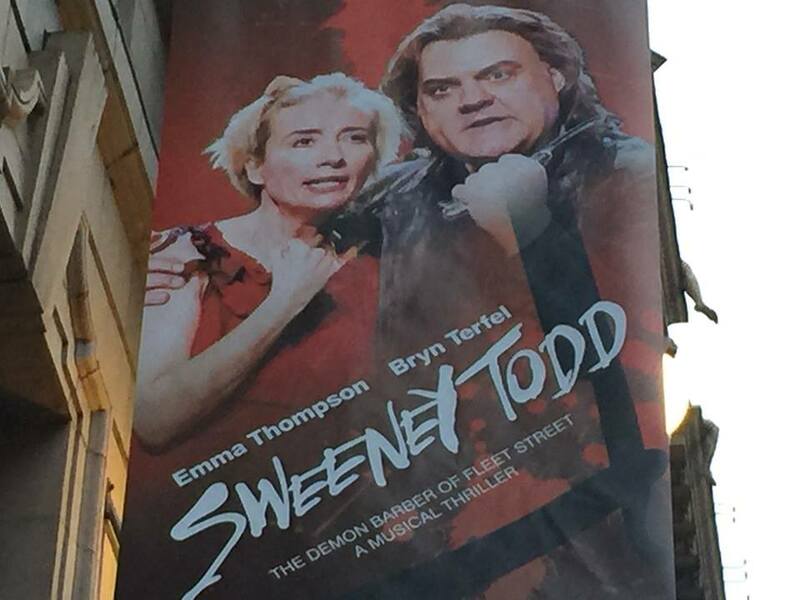 Bryn Terfel as Sweeney Todd. Where to start? To see and hear him sing this role is one of the greatest privileges any musical-lover will be granted. His voice purrs with such richness and power that it feels like hearing a Rolls Royce Phantom driving around a hilly course after a procession of family cars: you hadn’t even realised that such expressive, velvety sounds existed in a car engine. Having heard many fine performers sing the role, I hadn’t imagined how much more expression could be found. I sat open-jawed in joy at the powerful beauty of the singing. But there is far more to the performance than just the voice. Terfel’s success in every major Opera House globally is also due to his fine acting ability. His interpretation of Wagner’s Flying Dutchman at the Royal Opera last month was stunning and he brings superb arch-baddie-acting style to Scarpia in Tosca, delivering a performance equal in quality to Alan Rickman’s Sheriff of Nottingham or Hans Gruber. His Sweeney is all brooding intensity and his mesmerising stage presence incredible. The Welsh man-mountain has no problem filling this huge stage. I was worried that no Mrs Lovett would ever be able to convince me after seeing Imelda Staunton’s version in 2012. I need not have concerned myself here. Emma Thompson is stunning in the role and brings a huge serving of Hollywood quality to St Martin’s Lane. Perhaps due to the size of the venue and production, she emphasises the comedic element of the role and holds the 2,200+ audience in the palm of her hand. This is at the price of some of the more subtle dramatic moments, such as the heart-breaking moment during Not While I’m Around, when she realises she will have to kill Toby because he has figured out Sweeney’s game but not realised that Mrs Lovett is in on the act. This decision on emphasis is, however, perfectly correct and shows that there are two ways to play the role and still hit perfection. Will anyone other than Thompson or Staunton ever match up? Until now, I thought no-one could match Staunton, so maybe, but I can’t see how. The rest of the cast read like a Who’s Who of the West End, although there is justified criticism of the ENO for not selecting members of their own Opera company to highlight their talent and perhaps drive more Sweeney-lovers to try other ENO productions. Philip Quast, as Judge Turpin, is an inspired casting decision. His acting is legendary – he is one of only three people to have won three Olivier Awards, the other two being Sir Ian McKellen and Dame Judi Dench. Those three Oliviers have all been for musical roles, so his singing is top-notch. This is critical, for without a heavyweight singer, the beauty of the duet Pretty Women would have been lost. Only by pairing the world’s leading operatic baritone with the three-time-Olivier-winner could this be a reasonably fair fight. Indeed, hearing these two giants sing that song ranks as one of my ten best moments ever in the theatre. Alex Gaumond, as Beadle Bamford, plays the role with real menace and eschews the obvious sycophantic style in favour of far greater subtlety, which hits the mark. He is a real rising talent in the West End. Following successful stints as Mrs Trunchbull in Matilda and Freddie In Dirty Rotten Scoundrels, his next gig will be as the male lead in Seven Brides For Seven Brothers at the Regent’s Park Open Air Theatre this summer. Matthew Seadon-Young makes an excellent Anthony. The role represents one of Sondheim’s few flaws in the piece: as one of only two unambiguously good characters, it is important that the audience sympathise with him in order for the piece to maintain moral ‘bottom’, but Anthony is always wet and pathetic. In most productions, you want to throttle him. For the first time, I was on Anthony’s side in this production. He sings well and plays the part with quiet self-confidence. This may seem like damning with faint praise, but is actually high praise indeed. Conducted by David Charles Abell, the 48-piece orchestra is a joy, with the pacing perfect – never rushed but never slow – and the sheer number of musicians (combined with their elevation to the stage) brings an incredible lush quality to the piece. This is particularly evident in The Ballad Of Sweeney Todd and Pretty Women. My only criticism of the orchestra would be for two pieces where soaring strings typically give extra lift to the music: Green Finch And Linnet Bird and Kiss Me. Both of these songs seemed flat somehow, although I could not lay my finger on quite why. The lack of full staging renders it impossible to mark this down as the definitive production, but its musical and casting luxury mean it must surely be the definitive audio production. A true joy for any Sondheim fan. You will never hear Sweeney Todd sound anywhere near as good as this in your life again. 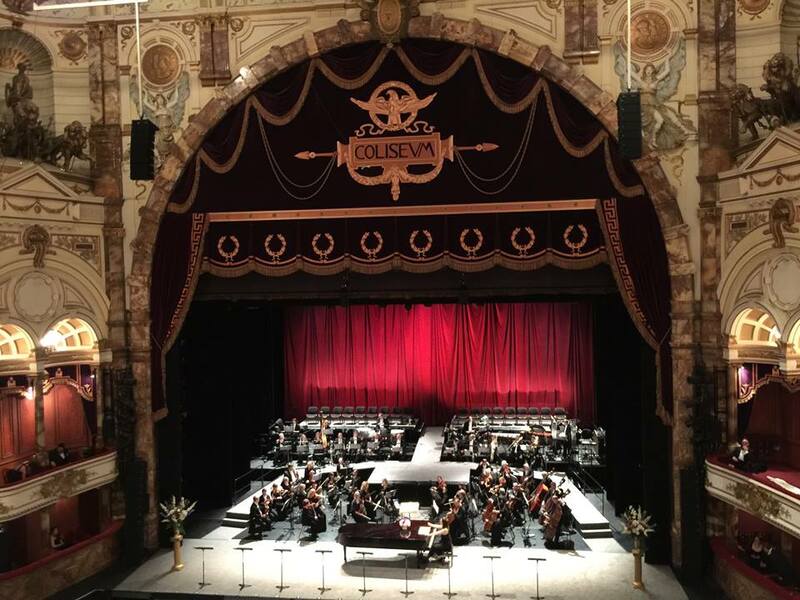 This entry was posted in musicals, opera and tagged Alex Gaumond, Bryn Terfel, David Charles Abell, Emma Thompson, English National Opera, eno, London Coliseum, Matthew Seadon-Young, Mrs Lovett, Philip Quast, Sweeney Todd by showbusinessinsights. Bookmark the permalink. Thanks for your comments. Glad you liked the review and hope your mate enjoys it!